All About Our Dark Hardwood Floors | A review and the pros and cons of having handscraped dark hardwood flooring in your home. I share my reasoning and favorite cleaning tips. Today I’m tackling a question that I’m asked about a lot- the pros and cons of having dark hardwood floors. When it came to choosing the new flooring for our home, I always had a very clear vision of having extremely dark hardwood floors. They seemed to be the perfect contrast to my love of light colors everywhere else. We began to take the leap three years ago and purchased all of the dark hardwood flooring we would need for the first floor. Here are my pros and cons to living with dark hardwood floors! First off- the floors themselves. They are Virginia Mill Works Bell County Hickory from Lumber Liquidators. Unfortunately, that flooring is no longer available. I am told that the Virginia Mill Works Harvest Hickory is very similar, just slightly lighter and a bit warmer in color. Some people may ask why the floors “needed” to be replaced. I’m the first one to admit when we do a project for aesthetics only. However, there wasn’t a single flooring type out of the six(!) on the first floor that was in good shape. The linoleum was cracked and peeling. The hardwood was worn and damaged. The carpet was threadbare. Any rooms with tile had cracks and missing pieces. Although we aren’t planning on moving anytime soon, we knew we would get our money back for “hardwoods throughout the first floor”. That is especially true because we chose a material that could stand the test of time (more on that in a bit!). We opted not to try to refinish the existing hardwoods and fill in between with new boards because they were all at different heights- so there wouldn’t be a smooth transition anyway. While we were looking at samples, we were warned again and again that dark floors weren’t a good choice for us, with a young family and a dog. The guy at the flooring place tried to repeatedly sell us on honey colored laminate- which was pretty much as far from what I was looking for as you can get. There was (and is) some logic to what he was saying. It’s inexpensive and durable. We have a golden retriever (i.e. blonde dog hair) and messy kids that generate crumbs. However, that just wasn’t what I was going for. 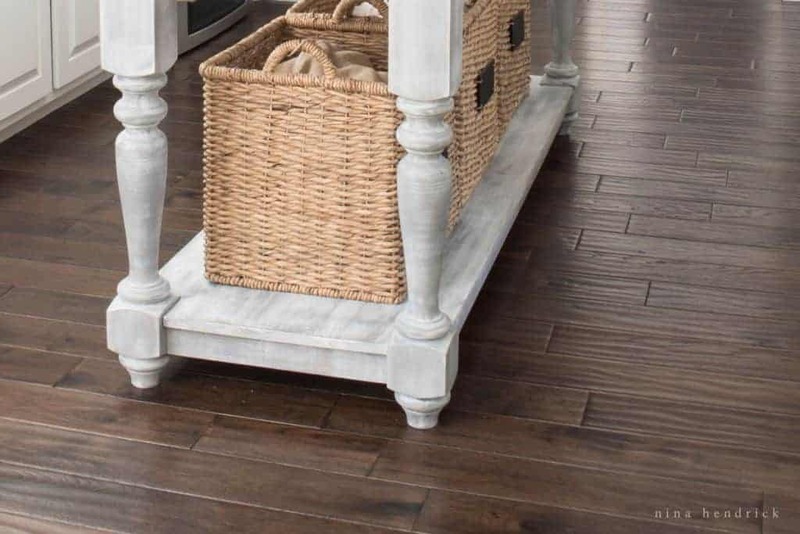 While beautiful, these floors are high maintenance. They have to be vacuumed at least once a day because -as predicted- every speck of dirt, dust, and dog hair shows. For ultimate convenience, we invested in a Dyson stick vacuum (we have the older version). Being cordless makes it quite easy to simply grab it off of the charger and do a quick run. Better yet, it’s lightweight and easy for the kids to use, so they can be sent to grab it and clean up after themselves if they make a mess. For mopping, the floors look like new when I go over them with the Shark Steam mop. I try to use an eco-friendly floor cleaner instead of what comes with the mop. If I had to choose the biggest issue with dark floors, I would say that the cleaning would be it. However, it isn’t a deal breaker and probably keeps us neater in the grand scheme of things (which certainly isn’t a bad thing!). If I was building a house today, I would still purchase floors on the darker end of the spectrum. Now that we’re three years in, we’ve inevitably also had a few scratches. The floors are extremely close in color to General Finishes Java Gel Stain, so I use a q-tip to apply it, as well as a little bit of high traffic polyurethane. It does the trick, and the scratch is no longer visible because of the rustic texture. In a pinch, we have also used a black permanent marker in spots, and you can’t even tell. A con would be that scratches are more obvious. However, I think that choosing a rustic texture is more forgiving. Although it’s also important to note that the handscraped nature of the wood leads to some challenges. I was given a robotic vacuum as a gift, and it wasn’t able to navigate the bumpy floors. So if you have your heart set on one, you may want to choose a smoother texture. Also, if ever we decided to refinish these floors, the handscraped texture means that we will have to do extra sanding. We would lose the character of having them handscraped. To try to prevent having to sand in the first place leads to my final talking point- the wood type. I love the look of wide pine floors. However, I knew it wasn’t practical at this point in life because of their softness. Contrary to popular belief, I’m not against oak- but hickory actually proved to be a harder option. We have been happy to deal with minimal issues due to this choice. You can use the chart that we did to compare flooring types here. Overall, the pros of beauty, durability, and character outweigh the cons of visible dust to me. Ultimately, you will have to weigh your own pros and cons. It will help to take your lifestyle into account if you are considering hardwood floors. I hope at least that this post may have helped you along the way!